The PARTY BUS makes your child’s special day even better. No hassles, no mess and no worries. Book Sunday through Thursday and get our TWO hour Economy Rockstar package for $359 tax included. This is for up to 20 people and includes 2 jumbo pizzas and a Party Bus T-shirt for the birthday child while quantities last. Stuck for loot bag ideas? 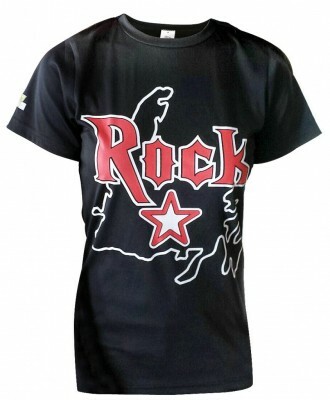 These high quality Rock STAR T-shirts are just $10 each when you buy 10 or more! Please pre-order sizes. Want a Friday or Saturday? The PARTYBUS has limited space on the weekends but we usually can squeeze you in for 2 hours. Cost is $399 tax included with free Pizza for up to 20, and a Party Bus T-shirt while quantities last!. That’s less than $20 per child taxes included based on 20! An incredible deal. Got more people, Have the 30 passenger bus for $449 tax included, the 40 passenger for $499 tax included or the HUGE Rockstar Coach for $649 tax included. Book early, space is limited! Call 727-8928 or e-mail info@thepartybus.ca. Want a theme package? Click the links above and check out our magic or jungle package, always a hit for sure! Please note that at least one parent or adult chaperone must accompany all kid’s parties. Party Bus is diligent in making sure that our drivers meet the highest standards, with impeccable driving records and no criminal records. Parents can rest assured that we will take care of all the little details so that their experience is the best each time they ride with us. The PARTY BUS and staff are more than willing to tailor the birthday party to your specifications, just call for a quote! Make the ultimate party machine your first call. To print a Party Bus invitation right click on this link and download it to your computer. You can then open it in Adobe Acrobat and fill in the boxes. You can then print it, or save it to print later. Interested in hearing about breaking deals & promotions, sign up here! Copyright © 2011-2014, The Party Bus. All Rights Reserved.